If you haven’t been in the loop recently on Acumatica news, you might have missed that we’re pretty excited to be working with Amazon Web Services. In fact, you can take Acumatica for a full test drive on the AWS Test Drive Site. Cloud platform is getting to be big news these days, but many businesses, applications, and IT professionals are still considering how best to make the leap. In a relatively new space, software companies are sometimes wary of entrusting their applications to the cloud. But there are lots of advantages for those who make the move earlier rather than later. 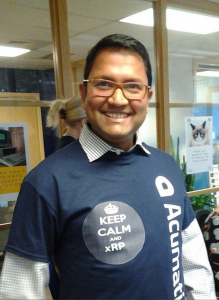 Ajoy Krishnamoorthy, the head of ADN and the Cloud xRP Platform Division, has a few thoughts on this, based on his recent work with some of our ISV partners, like AutoStar Solutions, JAAS Systems, JAMIS, and FuseForward. All of these partners have forged the trail to the cloud, and gained valuable perspective and success from it. Ajoy will be leading a webinar on April 15th at 10:00 AM PST to talk about the most critical elements of a successful modernization process. The post Register for a New Webinar: 5 Things You Need to Know about Modernizing Your Application for the Cloud appeared first on Acumatica ADN.